Part of the fun of reading comic books when I was a kid was coming across ads for the absurd: Monster Size Monsters! X-Ray Vision Glasses! Kung-fu Sandals! (AUTHENTIC! Worn for Centuries by Oriental Fighting Masters!) 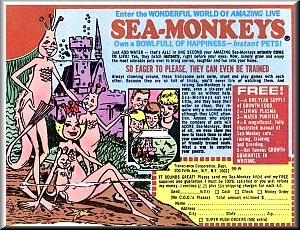 But my absolute favorite adverts included invitations to “Own A Bowl Full of Happiness.” For just 49¢ plus $2.99 shipping, you could raise your own “trainable” insta-pet, the Sea Monkey. Sea Monkeys fall into a general group of organisms including brine shrimp and “fairy shrimp” that, with the proper mix of nutrients and chemicals, can be stored in dry form and then “revived” with a dose of plain tap water. Recent rains have nourished our New Jersey swamps and freshwater marshes, transforming seeming terra firma into vernal or ephemeral ponds. These ponds – or more specifically their “fairy shrimp” inhabitants – get me out in the field looking for Sea Monkeys. The descriptive terms for these freshwater wetland types — “vernal” and “ephemeral” — refers to their habit of appearing in spring and being short-lived or temporary. Many vernal ponds in New Jersey and elsewhere were not protected during the post-World War II building boom. But with the passage of the New Jersey Freshwater Wetlands Protection Action in 1987, all freshwater wetlands – including these temporary wetlands – were finally granted protection. Fairy shrimp benefit directly from these protection measures. 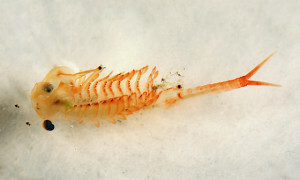 A common species of fairy shrimp in our New Jersey vernal ponds is Eubranchipus vernalis. It grows between 0.5 and 1.5 inches in length, and other than its forked tail and large, stalked, compound eyes, its most obvious features are the 11 pairs of feathery appendages it uses for swimming, breathing and feeding. It collects algae, bacteria, protozoa, rotifers, and detritus on the feather-like structures and transfers that material to its mouth by other appendages. In addition, it will scavenge dead tadpoles, mollusks and amphibian eggs. The shrimp’s reproductive strategy is fascinating. After mating, the male dies. The females are easily distinguished from males by the egg-filled brood sac on their abdomen, and the sac contains one of two types of fertilized eggs depending on the density of males in the pond. A low density of males results in thin-shelled “summer eggs,” which have a very short incubation period and hatch inside the brood sac. A high density of males results in thick-shelled “winter eggs” that eventually fall to the bottom of the pond and remain there even when the pond dries out. They will hatch the following spring, when the pond refills, and they have an amazing capacity to withstand extreme elements, including temperatures that are probably never encountered in nature: from a high of just below boiling (210 degrees) to a low extreme of -310 degrees. The powdered thick-walled eggs of fairy shrimp are the type that my sister Julie purchased in 1978 from the back of an Archie Comic Book. It is this egg stage that enables the fairy shrimp to be distributed to other potential vernal ponds. Fairy shrimp eggs are tiny, dry granules that can be blown by the wind or picked up on the feet of animals and carried to other vernal ponds. These thick-walled, dry eggs remain viable even after 15 years, and the eggs are supposed to hatch 30 hours after being submerged in water. Sadly, Julie’s order of Sea Monkeys never hatched. While she was perhaps permanently scarred by being duped into purchasing a package of powdered brine shrimp, I remain suckered in by the advertising and happily spend spring weekends exploring New Jersey’s vernal pools looking for my own Sea Monkeys to train.